The Monitor Audio Radius 390 Subwoofer - Promising the astonishing low frequency resolution of the Radius 380 with the added depth, impact and control of a larger bass engine, the Radius 390 demolishes assumptions of size versus performance. With every earth-shaking transient, you’ll be more convinced that the compact 390 is truly ‘ground-breaking’ in form and function. A system of twin colour-coded 10” C-CAM® active/ABR drivers is powered by a 220W Class D amplifier to expand levels of output and extension, releasing a rich layer of penetrating bass, mesmerising in its consistency and scale. 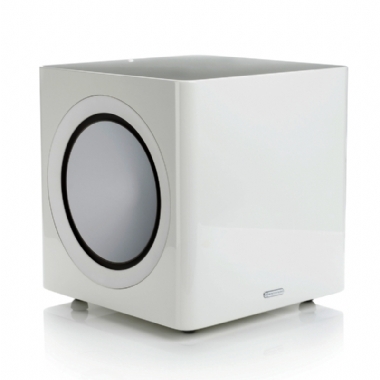 You’ll get agility as well, for rhythmic depth with music, and dynamic reinforcement in home theatre systems - all this from a beautiful little cube that liberates living space. In tune with Radius philosophy the 390 is perfect for lifestyle but sonically it’s in a class of its own. Enjoy rapid EQ optimisation from Impact, Music and Movie settings, and system automation via the 12V trigger.